In the matter of a few weeks it will be Christmas. Which is just crazy to think as at the start of December Alby will turn one ! 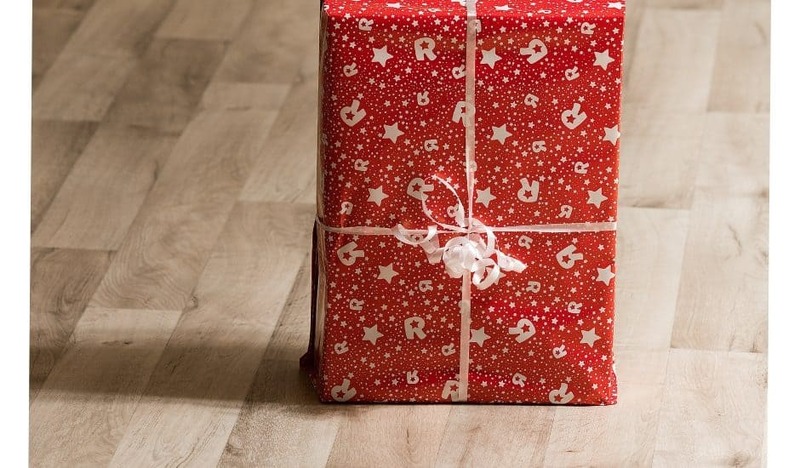 Having a child with their birthday so close to Christmas is hard . 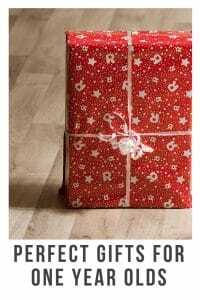 Not only is it expensive but it gets hard to know what to buy them.So I thought I would do Some of the hard work and put together some possible gift ideas . 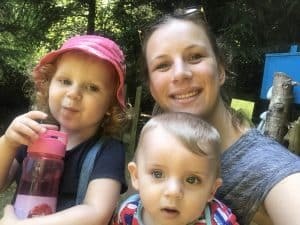 I have been looking for products that would be perfect for a one year old and here are my favourite finds. Alby is a lover of music or anything that makes noises . So this cute little penguins is perfect. This is great to be used on flat flooring like laminate as every time they knock it. 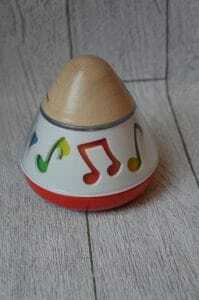 It will move and wobble around whilst making a little jingle. 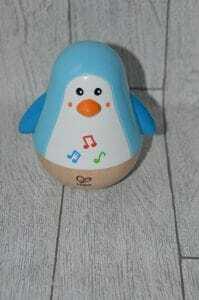 The Hape rotating music box introduces little one to music . This beautiful music box will make a great addition to little ones nursery . With a simple twist of the base the music will start to play . As the outside of the box turns round so do the colour that show through the musical notes. Not only is this perfect for babies toddler will love it the . The shape of the music box means it rolls around really easily making it a fun game for children to knock and crawl around after. This beautifully designed toy features natural wooden textures and bright colours designed to stimulate little one’s senses. All Hape toys are made from the highest quality non-toxic materials making them the perfect for little ones. Alby’s so close to walking by himself . So whilst looking at gifts for him I have been looking for things that may encourage him to work . This walk a long hedgehog is just adorable. I’m hoping it will distract him from what his doing and actually encourage him to walk. It’s so beautifully made and the wood is or such a high quality I know it’s going to withstand Alby bashing it around whilst his finding his feet . I also liked that the string length isn’t too long . As this is something that worries me with pull along toys . In the past I have had to cut them down so they don’t become dangerous. When you move this adorable little hedgehog across the floor parts of the hedgehog move . Which just fascinates Alby as his trying to figure out how it works. This is one of those gifts you buy for the little ones but you know the eldest is going to love it. Ava has loved pulling this around the house taking it for a walk as if it’s her little pet. Kids just love the bang things and make noise don’t they so I know this is going to be a winner in our house . 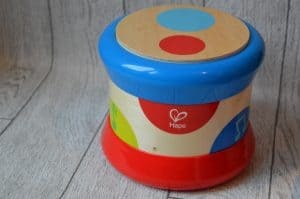 This beautiful baby drum has colourful flashing lights , colourful circles and a funky melody that plays when you roll the drum. When the drum is upright they can bang on the top of the drum making a different drumming sound with each hit . With the added flashing lights to capture their attention. 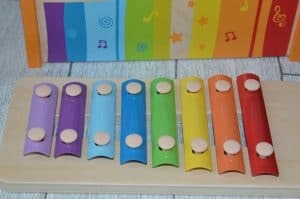 This is a great first instrument to encourage hand eye co-ordination and also encourages them to have fun with sounds. This would also be great for children that are learning to crawl as the drum makes noises when it’s rolled across the floor . Which would encourage them to crawl after it. Toys like this normally go through lots of batteries . Or once the batteries have gone you just keep forgetting to put new batteries in them . This baby drums very cleverly goes into power saving mode if the drum isn’t played with for 2 minutes. Which means the batteries will pay for longer. This I think is going to be the toy that both my children are going to want to play with . Along the top children can tap the balls through the circles along the tap which then falls onto the xylophone. Making so really lovely sounds. 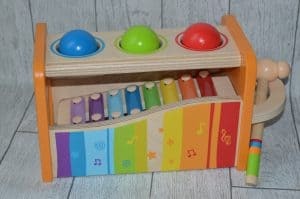 For children who just want to explore the xylophone this can be removed from the bench and played with separately which I think is such a great idea. The tap and bound bench enables children to learn so many things from hand eye coordination and dexterity to matching and logic skills. Making this a toy that can really grow with your children . As when they get older they will learn more and more different ways to play with it . Like all the Hape toys shown above it just looks beautiful . 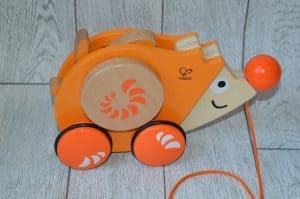 We are lovers of wooden toys and Hape is one of our favourite brands . As they really withstand heavy-handed children which mine are . They also look lovely. 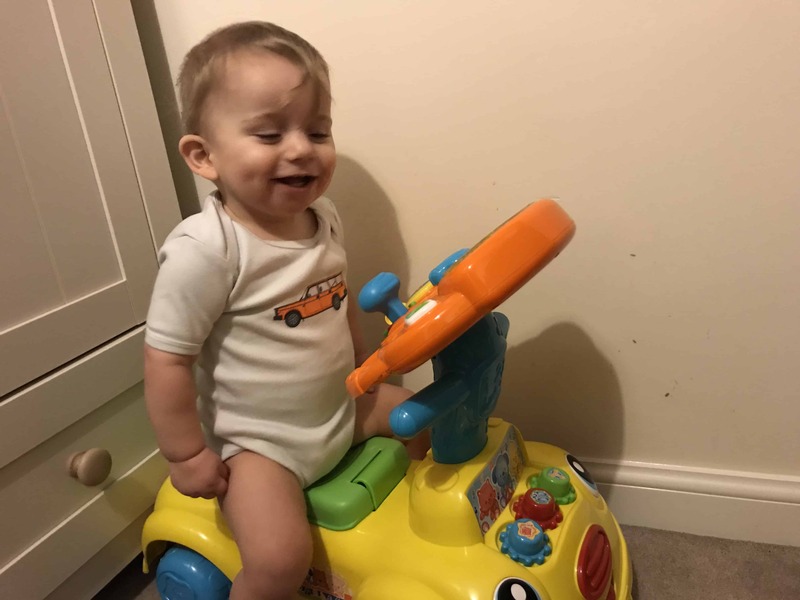 The Hape and Tap bench is also the winner of the 2018 Cribsie Award for Favourite first musical toy. Maybe your more of a practical buyer and like to buy things you know they will need . Well babies always need nappies and wipes and I know I would be more than happy for someone to buy Alby some nappies and wipes as we get through so many . These nappies from Kit and Kin are just adorable . They have really cute animal designs on them . Not only do they look adorable they are eco nappies. They use sustainable materials to help end our dependency on non-renewable resources. Kit & Kin’s super absorbent core contains chlorine-free fluff pulp harvested from sustainably managed forests and the front panels, tapes, anti-leak barriers and packaging are all made from an oxo-biodegradable material. They are also a proud member of PETA. We have had issues with ably and nappies . None of them seem to hold enough . He leaks most days which is not just annoying it means my washing machine is constantly on. Whilst using the Kit & Kin nappies I did notice he leaked a lot less . I was having to change him less through the day . Which is amazing so even though they are a little more expensive than the nappies I normally buy I’m having to use less and they are better for the environment so that’s got to be a winner right. We also tried their wipes which are 100% biodegradable. They are £2.50 a pack which is more than I would normally pay but they are so gentle on the skin and don’t contain any nasties. I did really like these they are a little less moist then the normal brand we use. But they still did the job and in the long run they are better to use. Kit and Kin also do some lovely bath and skin products. Which if your making up a hamper or looking for some stocking fillers maybe for little ones they would be lovely for . I especially loved the magic salve it cleared up Alby’s rash really quickly. I have also been using it on my face as my skin has been so sore lately and this has really helped it . So overall the kit & Kin products would make a lovely practical present . Kids something get loads of toys and lets face it at 1 years of age do they really need loads and loads. I’m really picky with what I put the kids in especially Alby . As I find the prints can be too much . 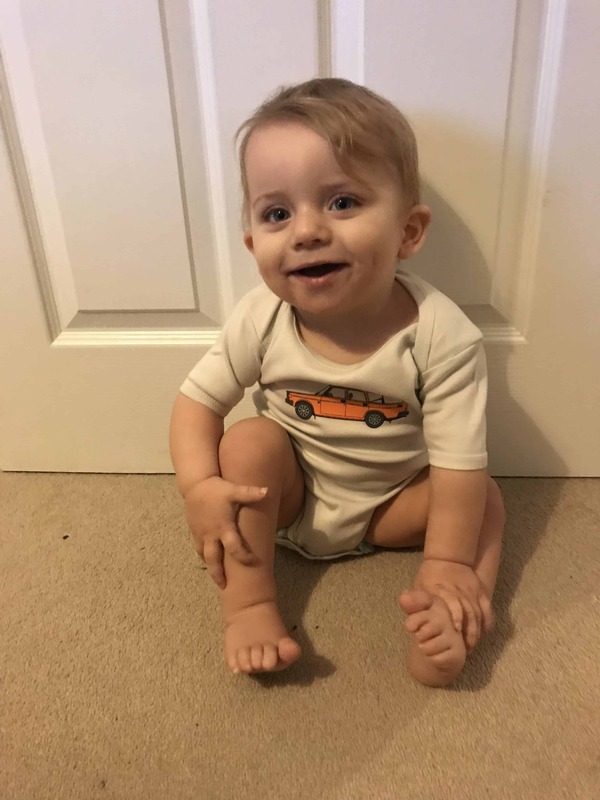 Alby loves cars and I have found it so hard to find A nice top with one car on . That doesn’t say beep beep or other words plastered all over it. Then I got sent this adorable babygrow from Volvo and I love it . I just wished they had this available in jumpers and tops. At £12.45 it would make a perfect gift for a little one who loves cars. Or maybe their parents like cars I’m sure they would appreciate this cute baby grow for their little one. I hope this has given you some gift ideas for your little ones. Have a lovely Christmas and remember to enjoy it they are only little once so take it all in. Needing some gift ideas for adults did you see my adults gift guide?